With over 8.8 million inhabitants and only 151 sport facilities per 100,000 residents , the lack of suitable and affordable opportunities is one of the biggest challenges facing Londoners in getting more physically active. Now, public agencies such as the Mayor of London’s Office and Public Health England are recognising the positive impact that natural urban spaces can have on the physical and mental wellbeing of residents. Over 37.3% of Greater London is classified as ‘green space’ while 2.5% is classified as ‘blue space’ (rivers, canals, reservoirs). Maximising the use of these spaces for physical activity is crucial in our fight to decrease inactivity and provide Londoners with the right opportunities in the right locations. The Port of London Authority (PLA), responsible for keeping commercial and leisure users safe, protecting and enhancing the environment and promoting the use of the river for trade and travel, recently launched their 20 year Thames Vision which includes an aim to see greater participation in sport and recreation on and alongside the water. London Sport, in partnership with the PLA and Sport England, supported this vision with a bespoke research project aimed at assessing current river activity levels and the potential capacity for increased provision, including the main barriers restricting participation and opportunities for development. The scope of the project involved gathering primary data through an online research survey aimed at the 145 identified organisations operating on the Tidal Thames. 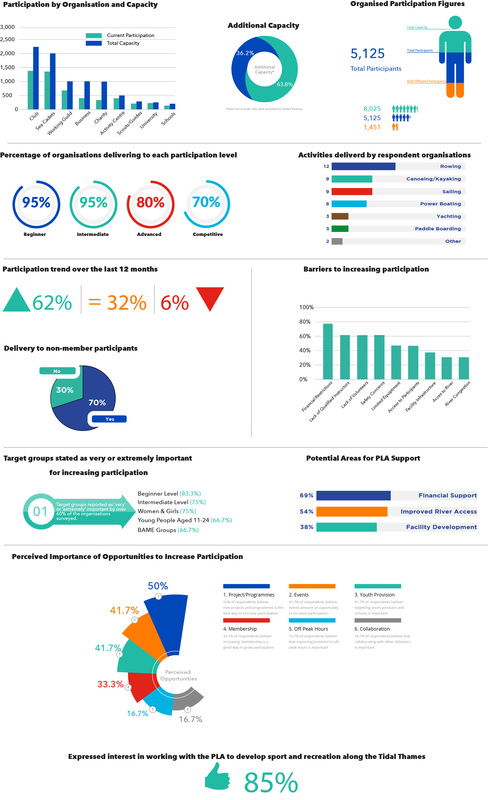 A total of 73 unique clubs and organisations responded to the survey request, representing over 50% of all identified organisations. The majority of respondents were clubs (58.9%), while feedback was also collected from educational institutions, activity centres, charities and other organisations. The research found that participation in water sports on the Thames has risen over the past 12 months, with 58% of organisations reported an increase and only 9% reporting a decrease in participation levels over the period. Furthermore, respondent organisations indicated that while over 19,000 people already take part, the overall capacity to cater for participants within the existing infrastructure has far greater potential of over 32,000 individuals. It was found that female participation (39%) is lower than male (61%), highlighting the potential for campaigns such as This Girl Can to impact positively on participation figures. Additionally, a large proportion of participants (48%) were found to be under the age of 25. The main barriers to increasing participation reported by a significant proportion of organisations were financial concerns (62%), lack of qualified instructors (58%), and lack of volunteers (58%). Over 50% of organisations also stated that facility infrastructure and limited equipment were highly restrictive. Importantly, findings suggest that different factors impact on participation along different stretches of the river. Identified as a key ‘opportunity zone’ by the PLA, East London presents unique challenges to increasing activity. Delivery caters predominantly for non-members through activity centres and a wider range of sports activities as opposed to the traditional club method dominant in other areas of London. Additionally, the importance of BAME groups as target participants substantially increases, reflecting the recognition that many East London boroughs bordering the Thames are more ethically diverse than other parts of the Capital. See the East London Factsheet below for a full breakdown of results in this opportunity zone. In light of these research findings, the PLA, Sport England, London Sport and the National Governing Bodies, British Rowing, British Canoeing and RYA aim to double the number of people enjoying sport and recreation along the River Thames. Initially, this is expected to involve making it easier to book outings on the water, providing more coaches to help people get started on the Thames, increased collaboration with delivery organisations and helping clubs to offer water sports during the day. Tristan Farron-Mahon is an Insight Officer at London Sport with a focus on primary and secondary data analysis and interpretation for the purpose of creating new understanding to support the development of physical activity and sport across London. Tristan was project lead for the Thames Activity research project, delivering the research in partnership with the Port of London Authority, British Rowing, British Canoeing and the RYA.